At the end of the pedestrian shed are ticket stalls selling tickets for bus transportation to Masjid-e-Namerah in case one is tired of walking. From the Jamaraat to Masjid-e-Namerah is 12 km and walking time is about 2-3 hours. Lots of people selling fresh food, fruit, drinks, juices, yogurt, ice cream, tea etc. on the way. Ample toilet/Wudhu facilities at regular intervals (every 50 metres). Ample cold drinking water taps at regular intervals (every 12 metres). Benches between water spouts for resting. Clinic facilities every 300 metres. 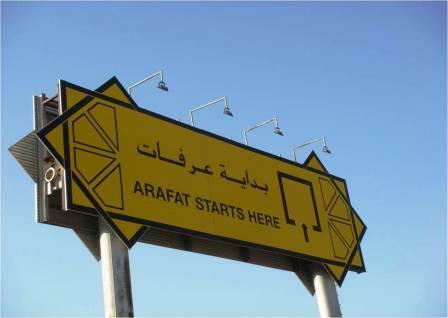 Distance marked to indicate how far from Arafat. A refreshment centre with toilet, Wudhu and shower facilities has recently been opened between Mina and Arafat specifically for the walking Hujjaajj. This centre distributes food free of charge too. Many more of these facilities are being planned for this walking route. The most difficult walk is from Masjid-e-Namerah to the Africa tents. This is about 3 km on roads which have all types of vehicles. Lately the government is devising a system where vehicular traffic will halt on an outer ring road, leaving the inner roads free from vehicles. Some success has been achieved towards this goal. Can be quite difficult to locate your tent area in Arafat, thus advisable again to link up with a person who has already done "pedal" Hajj before. Normally road number 2 is taken by pedestrians and then very near Masjid-e-Namerah, they cut through to road number 8 to get to the tent area for Africa. The police are also quite helpful - just show them your wristband. As soon as you are settled in your tent at Arafat, locate the ablution block(s). These will be even more congested than those in Mina; thus ensure you make, (and keep), your Wudhu much earlier than in Mina. You are normally in a large, canopy-type tent. The position between the air-conditioning units is a good place to book your spot as this provides a backrest. If there are no such units then the back of the tent is more secluded. Again, determine the Qiblah and opt for the rear section. Send your reps. to purchase refreshments, (only fruits, juices, soft drinks, yogurt, ice-cream, cucumber, dry foodstuff etc. ), as in Mina. Cold, (ice-cold! ), drinking water is supplied constantly in large water coolers in all tents. Some Hujjaajj have a tendency of packing these coolers with fruit and drink cans, so be careful. Many tour operators provide pre-packed snacks for lunch and another one for the night of Muzdalifah here. At the same time, the Muassassas also provide a type of camel meat Biryani on the house. Our advice is to opt for the pre-packs or the foods mentioned in the above paragraph. Do not become a hero by starting your Wuqoof outside in the sun immediately after Zuhr or else you will end up in hospital with heat stroke. At Wuqoof time do not even attempt to go to the “Mount of Mercy”, (Jabal-e-Rahmat), as this place is quite far from your tent area and you could easily get lost! The same will also apply in going to Masjid-e-Namerah. If you do happen to move around in Arafat, ensure that you are within its boundary for your Wuqoof to be valid as again the area is not geometrically symmetrical. 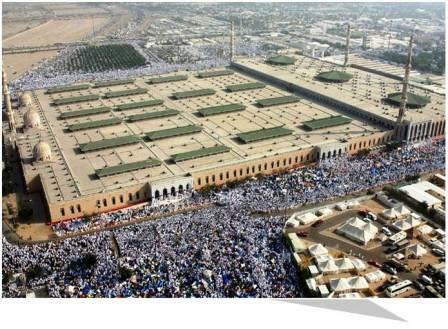 Note that a large portion of Masjid-e-Namerah is not within the boundary of Arafat. 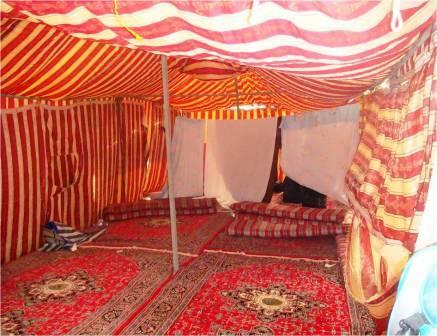 Make as much Ibaadat as possible in the shade of your tent. Rest if you have to! The best time for making Wuqoof is after Asr. 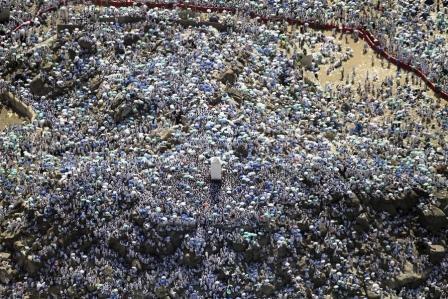 A little before Maghrib, leave your tents and proceed towards Muzdalifah, but stay WITHIN Arafat boundary. This boundary is clearly demarcated by huge colour-coded billboards yellow in colour. 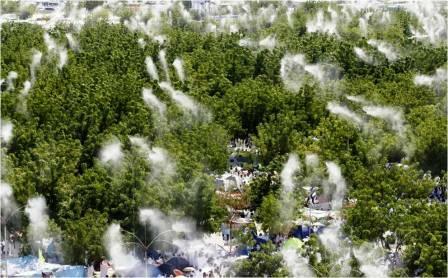 At Maghrib time listen attentively and you will probably hear canons being fired symbolising onset of Maghrib and your departure for Muzdalifah. 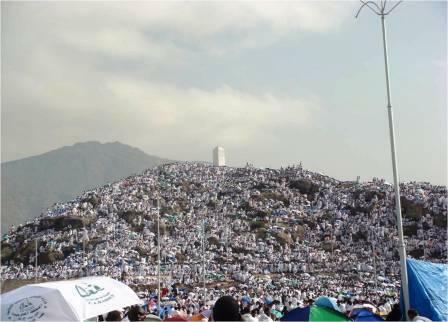 Experience from other groups has shown that leaving Arafat well past Esha time will be encountered with minimal congestion as regards human traffic enroute as most will have left for Muzdalifah immediately after Maghrib. On reaching Muzdalifah, this late group will find ample space here especially near the border with Mina as the authorities have pitched an overflow of tents of Mina into Muzdalifah. Generally not occupied on the night of Eid, which is the night of Muzdalifah. These tents have similar facilities as those tents in Mina. One may be lucky at times to use them if it not preoccupied by others. These tents may be empty as other sects will have already started leaving for Mina as they are allowed to do so by their respective Imams. The transfer from Mina camps to Arafat will again depend on when the coaches are released by the authorities, the frequency of the coaches' circulation and the general traffic situation. You may have to board well before Maghrib because of the above reasons; hence ensure that you have completed a major portion of your Wuqoof well before this. Traffic flow is at snail pace - can be as long as 3-4 hours, (or more), in the stifling heat inside the bus. Thus ensure you have ample cold drinking water and some foodstuff on hand. Another major disadvantage of being in the bus is that if one is in urgent need to relieve oneself for whatever reason, toilet facilities are not available on these short haul buses. Those with a poor bowel or bladder control may find relieving themselves there and then, especially children and the elderly. Other passengers on the same bus will then be subjected to this obnoxious sight and smell for the rest of the journey. The same is also true if one has to vomit while on the bus. It is for the latter condition that one is advised to keep plastic carrier bags handy for vomiting into. One more disadvantage is one will have to contend with diesel/petrol fumes whilst in the bus. The recently-built train system transports Hujjaajj within 10 minutes to Muzdalifah! As yet, most South African tour operators are studying this option before offering it to their clients in the future.